The strategy allow you to send high quality powerful backlinks to your money site , strengthens those high quality and improves the index rate of those backlinks. This kind of Pyramid should get you greater results and more traffic . 10 High PR9 Profile Links: ​Create manually 10 profiles backlinsk from PR9 Domain, All are Dofollow according to your choosen Keywords, will make an active cliklable backlinks to your site. 10 High PR8-1 Profile Links: I will create Manually 10 PR8-1 Profile Links with your choosen Keywords, will make an active cliklable backlinks to your site. 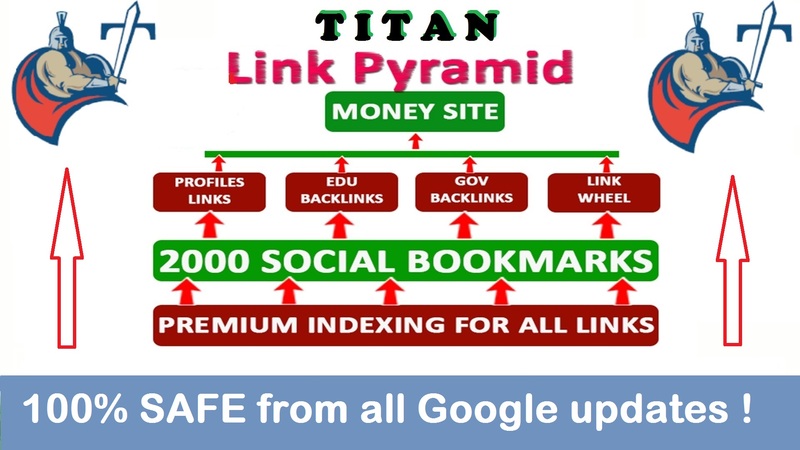 10 Edu/Gov Backlinks: I will manuallly Create 10 High PR EDU/Gov. backlinks . An "edu backlink" is simply a link from a public institution (University, High-School, etc) that points back to your page( very important ). 2000 Social Bookmarks : I will add 2000 Social Bookmarks . This will add an active Dofollow Backlinks connecting to your Step 1 Links . Indexing with Premium Tools: I will submit All Links to my premium indexer to get them Index . Your URL (multiple accepted but same niche ) . Your choosen up to 10 keywords . A short description about your business/website . Delivery frame is up to 10 days . Thank you .